Nevertheless, the NAMM (National Association of Music Merchants) show is always an exciting time for any music gear junkie, with the latest and hottest gadgets being unveiled to the world for the first time. But with so many new products being released, it’s often difficult to pick out the real gems! So I’ve decided to pick out my favourite releases and give you a little run down on each. I’ve tried to make the chart as varied as possible whilst still resembling my personal preferences, and whilst I know that there are LOADS more products worthy of a write-up, I don’t have all year, so please don’t get angry if your personal favourite doesn’t appear in here! It’s just a bit of fun, designed to also give you a flavour of what NAMM 2011 was about! Having said that, if you do have some differing opinions, please feel free to leave blog comments and let the world know what product(s) you feel should have been included and why! So, my chart is based on what I’ve read, what I’ve heard, and feedback from our lucky collection of employees who got to visit the show! Unfortunately I haven’t actually had the chance to personally test any of the new releases…but I can’t wait until that day comes! However, there is loads more information out there on each product, so if you like the sound of any, follow the relevant links and find out more! 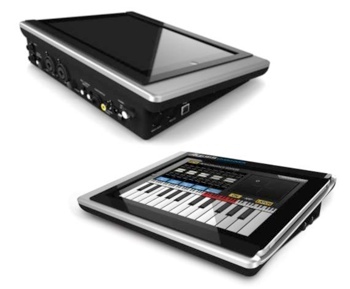 The Akai SynthStation 49 is the bigger bother of the SynthStation 25, but instead of controlling an iPhone/iPod application, the Akai SynthStation 49 connects to an iPad! The hugely flexible SynthStation application sits at the heart of this unit (downloadable separately from the iTunes store), and is accessible from both the iPad touchscreen, which sits at an ergonomic angle in front of you, and the hardware controller itself! The SynthStation 49 provides direct in-app MIDI recording from it’s velocity sensitive keyboard, 9 MPC-style drum pads, standard pitch and modulation controls, and an array of transport controls, and although it was designed for the SynthStation application, the SynthStation 49 controller is also compatible with a load of other music creation applications! The SynthStation 49 features a USB/MIDI port for computer communication, as well as professional 1/4" outputs, and it’s also extremely portable, so is perfect for quick set-up and on the-road performances. Click here for more information on the Akai Synthstation 49! The unusual design of the Egg has ensured it’s place in our Top 10 chart – it’s a loudspeaker, shaped like….yep, you guessed it…..an egg! As you may well know, speakers with sharp corners, and angled edges have often suffered from cabinet resonances and diffraction, which colours the output sound with a narrow, boxy component. Up until now, no manufacturer of loud speakers has attempted to fully address this issue, preferring the safety of a solid box cabinet to house the speaker drivers. However, now it seems we have the Egg! SE Electronics claim that the shape removes virtually all internal vibration modes, and the Egg features no spectral distortion apart from the drivers themselves. SE claim that the speakers are so accurate that you won’t be able to escape from a bad mix – if it’s bad, it will sound BAD! This probably won’t be to everyones taste, but it will be interesting to see just how different these speakers actually sound compared to other loudspeakers! Click here for more information on the SE Electronics Egg! New entry at number 8, it has the spark but will it shine as a popular product? The Arturia Spark is a creative beat production centre, which combines the power of analog synthesis, physical modelling and samples in one hardware/software drum machine hybrid. It’s geared towards making drum creation as quick and simple as possible for the user, whether you are in the studio or on stage, offering a host of important hardware controls, as well as a large library of drum kits with a vast range of different sounds (480 sounds/30 kits). The Spark features a 64 step sequencer (with 16 step keys featuring on the hardware controller), 8 velocity and pressure sensitive pads (to create your groove on-the-fly), a touch sensitive FX pad (to add an extra creative dimension to your beat creation), an advanced loop mode, real-time automation on all parameters, a 16 track mixer with 9 high quality effects (compressor, reverb, bit crusher, multiband EQ, chorus, delay, distortion, phaser, plate reverb), song mode (create and save arrangements by chaining up to 64 patterns together), shuffle and shift modes to humanise grooves, and assignable encoders. And of course, the Spark can also be used as a MIDI controller for any third-party software. Although I wouldn’t say that there is anything truly revolutionary about the Arturia Spark, it looks like it will cater to many producers needs, giving you a little bit of a different way to create your beats, and so I can imagine it being a fairly popular piece of kit. Click here for more information on the Arturia Spark! Something for the pianist now with the Roland V-Piano Grand. This instrument builds on the success of the original groundbreaking V-Piano, using piano modelling technology built into a grand-piano cabinet. The V-Piano Grand makes use of a unique multi-channel sound system that reacts naturally and intelligently to your performance, to blur the line between the two worlds of digital and acoustic. The new V-Piano Grand’s sound generator has been improved from the previous version, and new piano models have also been added to the onboard library. It’s like owning multiple pianos, but only having one unit! With the V-Piano Grand, every note responds and evolves naturally, seamlessy, and just as you would expect from a complete acoustic grand piano. Despite outputting it’s sound through speakers, the V-Piano Grand employs an intelligent multi-channel audio technology that ensures the piano sounds completely natural. This is achieved by routing every component of the piano sound to it’s natural location in real-time, meaning that every element of the output sound (e.g. ringing strings, hammer-clicks, etc.) comes from where you would expect it from a fully acoustic grand piano. Click here for more information on the Roland V-Piano Grand! It’s already a fantastic piece of software, but the new version 1.5 update has made it even more interesting! The new update includes a host of new inbuilt features, including a new 5-column browser view, support for polyphonic aftertouch, expanded synthesis capablilies, and a wealth of new library sounds. Spectrasonics have taken the time to listen to what users were requesting from the previous version, and have delivered in this new crowd-pleasing package. The most exciting inclusion in the Omnisphere update is mysteriously named, ‘the Orb’, and is a cool new sound manipulation tool, and an intuitive performance interface. It’s essentially an intelligent circular controller that analyses the patch you are using, and creates sound variations within a single control. So, if you have a patch loaded, and you want to create a sonic variation of the sound, simply use your mouse or MIDI controller (or finger if working with the iPad application), and move the controller to a different position within the Orb! Or if you want to create some interesting dynamic variations, flick the Orb and watch the controller bounce around whilst creating a unique, dynamic effect. If you don’t like what the Orb has done, then a complete new set of manipulations can be chosen by rolling the ‘Dice’ button, which instantly creates a new set of sonic modifications and effects! It’s a brilliant and easy way to create new, unique sounds, especially if you’re not experienced with sound design. Just choose a preset that resembles the sound you have in your head, and play with the Orb – no need to know what your doing or how you’re achieving it, all you need to know is that the sound is right! Click here for more information on Spectrasonics Omnisphere Version 1.5! Whilst not being one of those products thats going to induce the ‘wow’ factor, the Alesis Studiodock is something that was begging to be released by someone, and I’m sure it’s going to be a welcome addition to many people's set-ups. The Alesis Studiodock is the world’s first pro audio dock for iPad! The iPad is an exciting device, and has become home to some interesting musical applications, but up until now it’s credibility as a professional music creation platform has been restricted due to the limited connectivity that it offers. That may all be about to change though! The Alesis Studiodock is the first device that enables anyone with an iPad to interact with virtually any pro audio gear or instruments. It’s basically a universal docking station that has been designed especially for the iPad, and it gives recording engineers, and music producers the connectivity they have been craving to create and perform with the iPad. The Alesis Studiodock provides two combination XLR and 1/4" jack inputs (each with individual gain contral and switchable phantom power), so now you can connect your microphones or instruments up to the iPad. The Studiodock also features a guitar-direct switch, so it’s possible to perform and record directly into amplifier and effects-modelling applications. There’s also MIDI In, MIDI Out, USB MIDI and even an assignable 1/4" footswitch input. And with the two 1/4" jack outputs, you can connect your iPad directly to a pair of studio monitors or a PA system! Brilliant! All those music apps that until now have just been fun ways of wasting time, are now powerful music creation possibilities! Click here for more information on the Alesis Studiodock! The big DAW news coming from NAMM was the announcement of Steinberg Cubase 6. The new version of Cubase builds on the solid foundations of the previous version, but adds a few useful additions that may well tempt you to upgrade. Cubase 6 features a new Track Edit Groups option, which helps to streamline your work flow when dealing with multiple tracks. It basically allows you to group related events on multiple tracks and edit them simultaneously, plus a new Track Lane feature gives you a quick and easy way to combine multiple recordings for the perfect take. Cubase 6 even contains new, redesigned transient and automatic tempo detection algorithms, allowing for quantization, and drum replacement functions that are more accurate than ever before. Perhaps the most interesting and creative new feature of Cubase 6 is the groundbreaking Note Expression feature (part of Steinberg’s new VST Expression 2 technology), which allows you to create and edit multiple controller values on a single MIDI note created with a VST instrument. It’s a revolutionary way to work with MIDI, allowing you to quickly and easily edit every note individually. For example, apply varying filter sweeps to different notes in a chord, pan notes in a chord to different positions, etc, all within the same instrument/MIDI region! And on top of all this, there’s also Steinberg’s new virtual guitar amplifier and effects suite and VST amp rack, which comes with 7 amp models, 16 stomp boxes, 6 speaker cabinets, and 2 microphone types! Click here for more information on Steinberg Cubase 6! Any new release from the Dave Smith camp is always going to capture peoples attention, so I simply had to include the new Tempest in our top 10 chart! And as an added bonus, this isn’t just a Dave Smith product – it’s actually the result of a collaboration between Smith and Roger Linn, the inventor of the digital drum machine! But before you accuse me of letting the Tempest in on the merits of the names alone, I have to tell you that I was completely in awe when I saw the demonstration video! The Tempest is a drum machine, but the thing that makes it so exciting is that in true Dave Smith style, it is 100% analogue. Just skip to the demonstration in the video below (2:07) and have a listen for yourself, and you’ll hear what makes this drum machine stand out (especially if you’re not used to working with analogue drums). The Tempest features 16 velocity and pressure sensitive pads arranged in a 8 × 2 array to cater for real-time and step-entry beat creation. It also has two really cool pressure and position sensitive Note FX slide controllers to give you a new way to control your performance (watch the video for examples of how these can be used). However, what sets it apart, for me, is the sounds that it can create! It probably won’t be to every producers taste, but in a time where our music charts are crammed with heavily produced, rigidly structured, ‘plastic’ sounding drums and patterns, the Dave Smith Tempest really stands out as something different and unique. Click here for more information on the Dave Smith Tempest! This release is for guitar and bass players, and it sounds pretty cool to me! The Game Changer is basically a new switching system devised by Music Man, allowing the player to combine any order of pickup coils in series, parallel, in or out of phase, meaning that one Game Changer guitar is capable of producing a massive range of different tones – ranging from classic to completely new and unique! And the best thing of all is that all you need to do to achieve a variance in tone is use the Game Changer switching system – there is no need to rip your whole guitar apart and manually rewire it yourself anymore! A Game changer guitar offers over 250,000 pickup combinations (for a 5 coil instrument) and over 8 million combinations (for a 6 coil guitar) (WOW! ), and the audio signal is never digitised or modeled in any way, so you’ll still get that pure analogue guitar sound. And if you’re feeling generous, the Game Changer website allows you to create, save, and share your tonal selections with the world! The Game Changer sounds like a brilliant idea – it expands on the possibilities of a popular existing instrument without fundamentally changing it, and it has been described by certain musicians as one of the most significant guitar advancements ever! However, I guess only time will tell just how significant this technology is. Will it lead to songs being created with new unique sounds? Or will it just end up being a bit of a gimmick – nice to play with for a week or two, but becomes boring and redundant very quickly? No doubt we will soon find out! Click here for more information on the Music Man Game Changer! And topping our NAMM charts, with a truly spectacular release…it’e the Korg Kronos! For many, the product that really stole the show this year was the Korg Kronos. It’s the product that seems to do everything and more, has been given the blessing of a whole host of respected musicians, and most importantly, it can make some awesomely inspiring sounds. In all honesty, the Korg Kronos really deserves a whole blog post to itself, but I guess that is for another day, so for now I will do my best to pick out the best features, and describe them to you as briefly as I can! The Korg Kronos is essentially a monster of a workstation! It brings together the power of 9 individual synthesis engines in one instrument, which essentially means that this thing is one heavily versatile mother beast of a machine! Classic instrument sounds, plucked string sounds, drum sounds, unique synthesised sounds, analogue sounds, out-of-this world piano sounds – this thing can recreate them all with superb clarity and depth. They often say (and I agree) that when building a home studio, less is more. For example, it’s better to own just one or two synths and learn how to use them really well, than to own a dozen synths, and get lost in sound shaping! But the Kronos kind of breaks the rules here – it allows you to own one workstation (which you can familiarise yourself with as your main piece of kit), but within this workstation you can access a whole range of synths! So whatever synth you’re using you’ll always have the familiar controls of the Kronos to manipulate it with! It’s a fantastic concept! And if you’re after more than just a device to generate breathtaking sounds, then the Kronos almost certainly won’t disappoint you. It comes complete with a built-in professional sequencer (up to 16 MIDI and 16 audio tracks at 16/24-bit 48kHz) with mixer automation, a powerful sampler (sample an external audio source, the output of the Kronos, or load in samples), and a whole range of high-quality effects! All this is accessible using the vast range of physical controls on the Kronos, the large colour display, or the free software editor. And if you decide that the Kronos would better suit your way of working by teaming up with your current DAW, then fear not, as it features flawless plug-in integration and MIDI USB creativity! And it can even act as a 2 channel audio I/O interface for your computer, so there is no need to purchase any additional hardware! Finally, I’m going to talk about the connections featured on the Kronos, and there are certainly a lot of them! In fact, the Kronos provides a total of six channels of audio input: 2 analogue channels, 2 digital channels (S/P DIF optical), and 2 USB channels. And plenty of audio outputs are also provided with 2 main channels (L/Mono, R) as well as four independent audio outputs, 2 digital channels (S/P DIF optical, 48 kHz/24-bit), and 2 USB channels. All analogue inputs and outputs support TRS balanced connections, and the analogue inputs provide a Mic/Line ‘select’ switch and an independent level control for each channel, offering the flexibility to meet any situation. Additionally, the Kronos features 2 USB 2.0 ports for use with external storage media such as flash memory, hard drives, or CD-R/RW and DVD drives, so it’s really easy to back up your precious projects. The Korg Kronos is set for release in 61, 73, and 88 key models, and is the perfect partner in crime for any live performance or studio based music project. Click here for more information on the Korg Kronos! So there you have it! I hope that was useful and interesting! Feel free to post comments and let me know if you agree or disagree with my choices! Peace out!